Our socks provide Class-1, true graduated compression knitting with the highest pressure at the ankle (20mmHg) gradually decreasing towards the top of the thigh (15mmHg). The opaque fabric is a 100% latex-free smooth-knit combination of nylon & spandex to ensure a breathable yet comfortable feel against the skin – suitable for casual or formal wear. The waistline is designed to be non-constricting, while the toes feature additional support and padding for improved comfort. Compressions socks relieve uncomfortable swelling around the foot and improve blood circulation by providing graduated compression to the surface veins and muscles in the lower leg. This results in reduced muscle fatigue following prolonged periods of standing, walking, or sitting, and a more energized body throughout the day. Excellent for treating unsightly varicose veins. 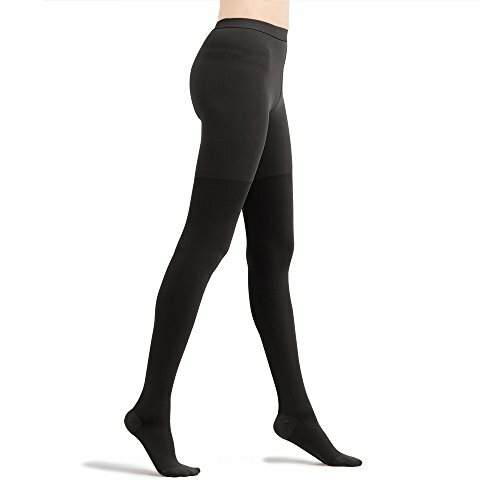 Compression stockings are designed to be tight to provide the proper amount of compression to the legs. Users are strongly advised to read the instructions on how to put them on or watch our YouTube instructional video.